Later in 1919, German stamps of the Weimar Republic and Bavarian stamps of King Ludwig III were overprinted for the new Republic of Bavaria. In May 1919, after the fall of the short-lived Bavarian Socialist (Soviet) Republic, Bavaria declared itself a "free state" in association with the Weimar Republic. 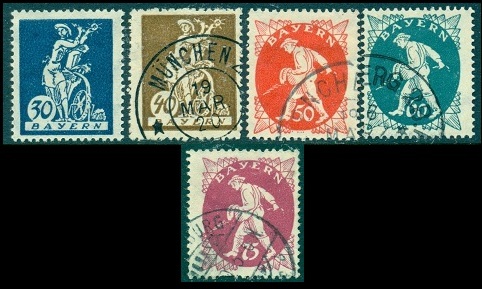 The sixteen Germania and Representative Subject stamps of the Weimar Republic were overprinted "Freistaat Bayern" between May and September of 1919 to celebrate the new "Free State of Bavaria", as shown in the images above (Mi. #136-51, Sc. #176-91). 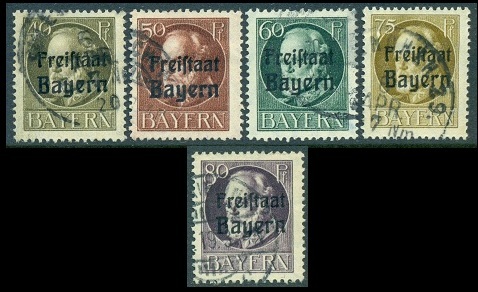 The well-over-used Bavarian definitive stamps of the former King Ludwig III were also overprinted "Freistaat Bayern" between August 1919 and March 1920, as shown in the images above (Mi. #152A-70A, Sc. #193-11). The perforation gauges and watermark attributes are the same as those for the 1914 King Ludwig III issues. All of the stamps used for this issue, except for the 75 Pf., are from the Wartime Printings. As with previous issues of this long definitive set, imperforate stamps were made available for sale to collectors (Mi. #152B-70B, Sc. #212-30). The mint condition imperforate stamps are about the same price as the lightly hinged perforated stamps. Used examples are much scarcer, and most of the ones on the market are favor-canceled (CTO) stamps. During the second half of 1919, the Republic of Bavaria issued three new charity stamps. The new issue, utilizing the 10 Pf., 15 Pf., and 20 Pf. denomination stamps of the King Ludwig III definitive series. The three stamps were surcharged "5 Pf." 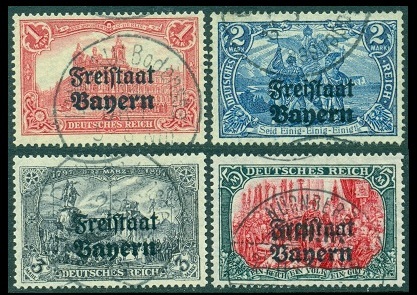 and overprinted "für Kriegs- / beschädigte / Freistaat / Bayern" or "for War-wounded / Free State / Bavaria", as shown above (Mi. #171A-73A, Sc. #B1-3). The surtax went to a fund for wounded World War I veterans. These three Bavarian stamps exist imperforate, but they were only issued in small quantities. One of them is shown above (Mi. #173B, Sc. #B3b). As a result, the imperforate examples of these stamps are scarce and expensive. At the end of 1919, there was a need for three new denominations to be added to the existing definitive postage stamps. The plates of the 1 Mark denomination stamp of the King Ludwig III definitive series were used to create three new definitive stamps in new colors, which were re-valued for the new denominations. The new stamps were all overprinted with "Freistaat / Bayern". The yellow green stamp was re-valued to 1.25 Mk., the orange stamp was re-valued to 1,50 Mk., and the blue stamp was re-valued to 2.50 Mk. The three re-valued stamps are shown in the scan above (Mi. #174A-76A, Sc. #231-33). They were also issued imperforate during 1920, for sale to stamp collectors (Mi. #174B-76B, Sc. #234-36). The mint imperforate stamps are about the same price as the perforated stamps. Postally used imperforate stamps are very scarce, and the prices reflect that. In January 1920, the 1890 3 Pf. 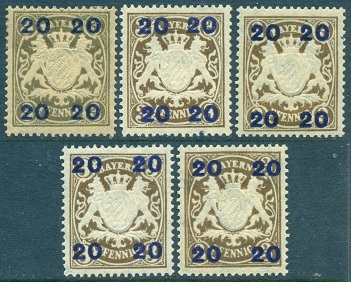 Bavarian stamps of the embossed arms design were used to create re-valued 20 Pf. stamps. The 3 Pf. was overprinted with a "20" over the original denomination in each of the corners of the stamp. FINALLY, in February of 1920, the Republic of Bavaria began to issue their very own, unique, postage stamps. The eighteen new Bavarian stamps were inscribed merely "BAYERN"! They are all shown in the images above (Mi. #178-195, Sc. #238-55). The low values of this new series featured a plowman, a sower, and an allegory of "electricity" - harnessing light to a water wheel. The lower Mark values featured a Madonna and Child. The high Mark values featured Friedrich August von Kaulbach's (1850-1920) "Genius", which was a symbolic representation of the Bavarian "Free State". The stamps were printed on papers with both the vertical and horizontal wavy lines close together watermarks. Many denominations of this set also exist imperforate, though they were not officially issued that way. These new Bavarian stamps were relatively short-lived though. In April 1920, Bavaria became a member state within the Weimar Republic. 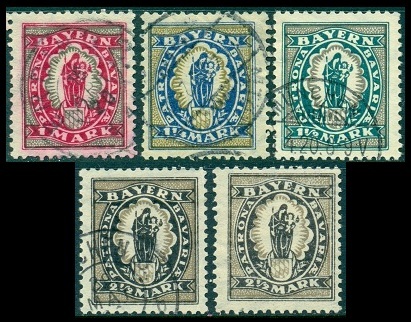 At that time, the current Bavarian definitive and official stamps were overprinted "Deutsches Reich", for use throughout Germany, though most of the issues were used only inside of Bavaria. 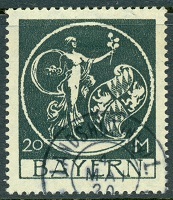 Since then, regular German postage stamps have been used in Bavaria.